ITS (Intelligent Transport Systems) is one of the national projects, which has been dealt with by the whole nation to help solve various problems concerning road transport. In this article, we introduce "Strategy Planning Dept., IT & ITS Planning Div." that is responsible for proper public relations of Toyota Motor Corporation (Toyota) for their activities aiming to actualize it. Especially, we focus on the visions painted by the automobile manufacturer towards ITS, as well as on the exhibits of Toyota at the "15th World Congress on ITS", hosted by New York Organizing Committee of the World Congress on ITS held in November 2008 in N.Y. In Strategy Planning Dept., they send out information about the advanced technology of ITS which Toyota is proud of, mainly through events. The World Congress on ITS is positioned as a part of this. Especially in the exhibition set along with the Congress, a new type of trial simulator was installed with the aim of having participants from all over the world actually experience the application scenes of Vehicle-infrastructure Cooperative Systems that support safe driving that the Company pictures for the near future. In realizing this, FORUM8's "UC-win/Road Drive Simulator" was adopted, which was a four-wheel actual car type based on 3D real-time VR (virtual reality). We interviewed Mr. Yasumasa Masujima, Assistant Manager of Strategy Planning Dept., IT & ITS Planning Div., and Mr. Koji Sonoda, Project Manager of the same Dept, both of whom had been involved with decision of installing the trail simulator for the exhibit at the World Congress on ITS, its system examination, operation, and utilization afterwards. Today, vehicles are something that we can’t think of separately from our life or economic activities. In other words, it can be safe to say that the modern society depends largely on diverse and a wide range of benefits brought about from road traffic. On the contrary, negative aspects have also been pointed out such as traffic accidents, traffic congestion that is becoming chronicle centering on urban areas, or environmental problems caused by exhaust gas. In order to solve these problems, they have been putting considerable efforts into improving their vehicles as an auto manufacturer, to say nothing of policies and measures implemented on the side of administration. One of these efforts is ITS, which the automotive industry has advanced in cooperation with governmental agencies and academia, applying state-of-the-art information and communication technologies (ICT), aiming to build up an integrated system of people, roads, and vehicles. The private-sector organization VERTIS (Vehicle, Road and Traffic Intelligence Society, presently ITS Japan) was established in 1994 in Japan to promote the commercialization of ITS. In the same year, the 1st ITS World Congress was held in Paris. Since then, the congress has been held in the major cities in the world every year. In 1995, the Advanced Information and Telecommunications Society Promotion Headquarters (headed by the Prime Minister) adopted "Basic Guidelines on the Promotion of an Advanced Information and Telecommunications Society”. In the following year of 1996, "Comprehensive Plan for ITS in Japan" was prepared in response to the positioning of ITS promotion in the Policy. It provided that the relevant governmental bodies should strive for developing and advancing ITS in cooperation, forming an organization to deal with ITS as a national project. After that, specific references to ITS in the relevant policies and measures have steadily increased, e.g. through enforcement of "Basic Law on the Formation of an Advanced Information and Telecommunications Network Society (IT Basic Law)" and development of "e-Japan Strategy" (2001), and "New IT Reform Strategy" (2006). Along with this, a part of ITS services have been put to practical use on a pilot basis, including car navigation, VICS (Vehicle Information and Communication System), and ETC (Electronic Toll Collection System). Under these circumstances, Toyota aims "to create vehicles and a mobility society in which people can live with a sense of safety, peace of mind, and comfort" as its one of the objectives for the coming age of ITS and a ubiquitous-network society. In order to achieve this, Toyota uses an approach of balancing the twin visions of "Zeronize" and "Maximize" at a high level. "Zeronize" means to minimize negative impact of vehicles such as traffic accidents and environmental burdens. "Maximize" means to maximize the positive aspects of vehicles, such as fun and delight. Toyota paints its ITS vision, that is, to achieve sustainable mobility society in the three areas of safety, the environment, and comfort. 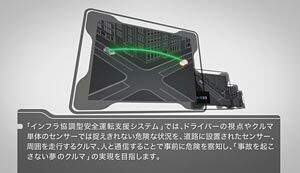 Among them, as the ITS-based approach to "safety", Toyota established the "Integrated Safety Management Concept", showing the direction of developing and promoting safe vehicles. With this Toyota is aiming to realize "a dream car that avoids traffic accidents" through the provision of optimal driving support depending on the driving conditions, by coordinating with the road infrastructure (road-to-vehicle) and using information obtained from other vehicles (vehicle-to-vehicle), while integrating individual safety technologies and systems equipped in a vehicle. One of the examples to actualize it is a safety system for a single vehicle (autonomous system) including Pre-crash Safety System (Millimeter-wave radar type) that helps avoid collision with an obstacle on the road such as vehicles in front, or reduce damage caused by collision. Another one is "Vehicle-Infrastructure Cooperative Systems that support safe driving" including DSSS (Driving Safety Support Systems), AHS (Advanced Cruise-Assist Highway Systems), and ASV (Advanced Safety Vehicle). Similarly, as the approach to "environment", they mentioned a comprehensive work to integrate people, vehicles, and the traffic environment by utilizing ICT, in addition to improving the vehicles themselves (developing a fuel-efficient car) and putting eco driving into practice. Especially from the view point of ITS, they aim to develop a system that combines "fuel efficient driving" with "smoothening traffic flow" based on simulations that take traffic volume into account, as well as to contribute to realization of CO2 reduction and low-carbon society through cooperation in improving traffic infrastructure that leads to mitigation of traffic congestion and improvement of traffic flow. Regarding the approach to "comfort", they focus on realizing the environment that free the driver from complicated operations and enables accessibility to necessary information anytime, anywhere. They intend to promote advancement of driving support functions concerning recognition of external information while driving, and operations / judgments to avoid dangerous obstacles. In addition, by linking data on roads and traffic accumulated at information centers with information from individual cars in real time, they intend to provide various information services. "Not capable of developing ITS itself, it is a division to plan what to do in several years ahead, "Says Mr. Yasumasa Masujima, referring to IT & ITS Planning Div. He also explained that one of the characteristics of the division is that a liaison section is placed independently for cooperating with the relevant governmental departments and agencies, as ITS include not a few fields that require more support than the mere in-house effort like vehicle-infrastructure cooperative system. In promoting ITS, it is important that the entire road transportation functions as a whole system. Therefore, in order to put ITS into widespread use, it is required to link and cooperate with a wide range of relevant actors in Japan and overseas. For this reason, Toyota has been participating in the ITS World Congress from its beginning, where researchers and representatives from governments / companies from all over the world get together to discuss the commercialization of ITS and report the results of theirs activities. "One can understand what the Vehicle-Infrastructure Cooperative Systems that support safe driving are like, if he or she rides in an actual car. However, it is difficult to have our cars ridden by many people at the exhibition site. That's why we planned to create a trial simulator." 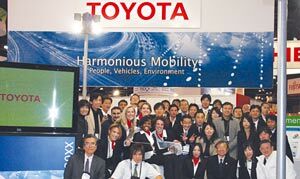 In the exhibition of the 2008 ITS World Congress, they set up a theme "Harmonious Mobility: People, Vehicles, Environment" to appeal their efforts of proposing a mobility society that Toyota aims at and realizing it. 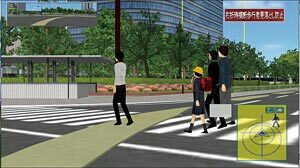 A new type of trial simulator was placed as a special-feature in addition to driving demonstration of "i-REAL" that is expected to be commercialized in the near future. Mr. Yasumasa Masujima, Assistant Manager of Strategy Planning Dept., IT & ITS Planning Div., and Mr. Koji Sonoda, Project Manager of the same Dept. Three people were directly involved in developing a simulator as staff in charge, including Mr. Yasumasa Masujima, Mr. Hideaki Takahashi (Assistant Manager, Technology Dept., IT & ITS Planning Div. ), and Mr. Akria Matsui (Project Manager, Advanced and Frontier Technological Strategy Dept., Integrated Technology Planning Center). In fact, Toyota exhibited a simulator produced by other company for experiencing the autonomous system at the Congress held in Beijing in October in the previous year. "We wanted to support the Vehicle-Infrastructure Cooperative Systems, but we were told that it would require more cost and time," said Mr. Yasumasa Masujima, explaining the reason for giving up the idea. On the other hand, they got information from Mr. Akira Matui concerning UC-win/Road by FORUM8, which also exhibited in the same Congress. Based on the information, they came up with the idea of using a simulator for the Vehicle-Infrastructure Cooperative systems targeted for the next Congress, instead of using a conventional approach of motion picture of the real scenes with explanation on panels. 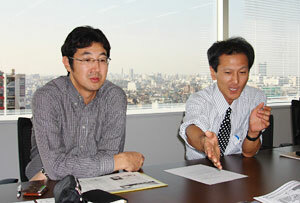 Then, after examining the feasibility, they decided officially on introducing the UC-win/Road Drive simulator. In building up a simulator, it required more time than expected to set up the driving route. It was intended to start the show room in front of Nagoya Station, go through the station onto the expressway, and arrive at the headquarter of Toyota Motor Corporation in Toyota City. Throughout the section, they aimed to incorporate various applications for Vehicle-Infrastructure Cooperative Systems that support safe driving as much as possible and have all the operations completed within about 3 and a half minutes, while representing the actual complex road structure. When it was completed to a certain degree, they had it tried by in-house staff. A problem was found that since the road structure was so complex depending on the route that the driver tended to focus their attention on driving, resulting into less feeling of the Vehicle-Infrastructure Cooperative Systems, which is actually important. Thus, changing the road structure several times, they kept on working through trial and error concerning easiness of driving or how to show ITS applications until the deadline for dispatch in the late October. Such fine adjustments to the systems were continued to be made till immediately before the start of the exhibition. Finally, FORUM8 staff in charge performed their job on site to reflect the adjustments. "We asked the staff to do their best until the end assuming that it should be restored to the condition at the time of dispatch if it didn't work properly there.” Considering that it was required to build up and complete the system in short time and to further examine it after replacing the road structure, it was unable to realize the project without cooperation of FORUM8, as Mr. Yasumasa Masujima looked back. During the exhibition period, they delivered numbered reservation tickets in advance to those wishing to try the trial simulator. There were about 200 visitors in total who tried it within four days. The visitors not only asked many questions about the Vehicle-Infrastructure Cooperative Systems themselves, but also showed great interest in the simulator, as Mr. Koji Sonoda stated. In February 2009, a large-scale demonstration of “ITS-Safety 2010” is going to be conducted as a part of "New IT Reform Strategy". 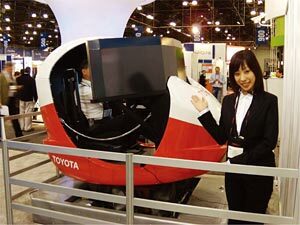 Toyota is also planning to exhibit this trial simulator there, for which the work of translating into Japanese is in progress now. 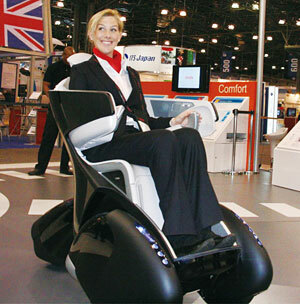 Furthermore, as these Vehicle-Infrastructure Cooperative Systems are expected to be commercialized in stages in several years, they wish to make positive efforts in informing the public about the necessity of the Systems using the trial simulator created this time at events in Japan and overseas including motor shows, with possibilities of extending the functionality suited to the Systems in mind.